After another hectic offseason, the 2018/19 season is underway tonight! Here’s a quick preview with my insight on each team! • I think Kawhi will be fine for TOR, and they’ll retain a top-two seed. He’ll remind many of how good he is. • I believe we’ll see the vast improvement of Fultz this season, as well as Simmons’ jumper; two things that will excel PHI. • BOS will remind us of how good they were last season. Call me crazy, but their style and depth may give GS a run for their money if they make the finals. • Even in a “lost” season w/out KP, Fizdale’s impact on NYK will show. Also look for a big sophomore jump from Frank. • BKLYN has some nice pieces and are certainly headed in the right direction. They may surprise many. • MIL needs to show that they’re not “just Giannis” this season. They have some nice pieces to prove otherwise. I like them. • Vic needs to – and will – prove last season wasn’t a fluke. This IND team is deep, and very balanced. • While everyone will be watching the decline of CLE w/out LBJ, I’ll be watching Love, who will show how good he’s been these past few years. • This is a pivotal year for DET. It’s playoffs or bust for the Blake/Andre duo. • CHI is obviously still rebuilding, but we will see another year of big improvement for the young guys. They have a promising core. • CHA is a very “meh” team. Though, Kamba must show he’s still a star this year to keep his value. • In the midst of a ORL rebuild, Gordon needs to show he’s a star in this league and worth the money. • With an ATL team low on talent, this a perfect year for Trae Young to adjust to the league and test some things. • This is a big year for the Wall/Beal duo. WSH needs to show they’re still a force in this league amidst all the other flashy drama. • MIA already has a solid team, but adding Jimmy B to the mix? 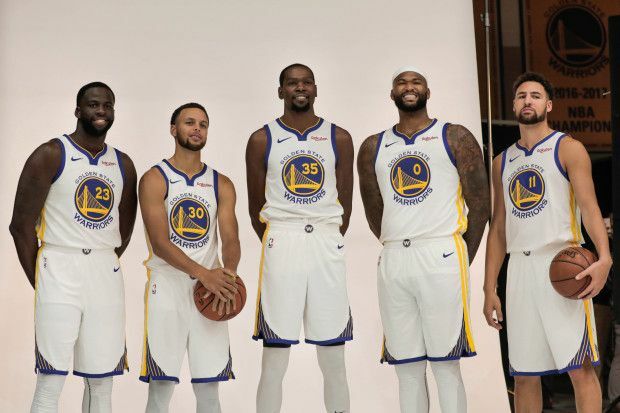 That could be one scary squad. • Many question if UTAH will follow up 2017, and I say yes. Still one of the most underrated teams in basketball. • It’s time for DEN to show they’re not just the NBA’s favorite underrated squad; they’re a contender in a tough conference. • After adding depth, and getting a committed PG13; I see a much better season for OKC. Monitor the health of Roberson though; he’s the missing piece to this team. • POR need a ton from Dame and CJ if they want any chance of grabbing anything higher than an 8 seed. Not likely IMO. • Well this team is a mess to say the least. With Jimmy back, things can go one of two ways for MIN: 1.) Jimmy inspires the hell out of his squad and pushes them for a mid-seed. 2.) It’s Jimmy vs. the Wolves all season and the team goes into shambles. I say more towards 1. • LAC is an interesting squad with depth and no superstars. They’ll be an interesting team to watch and are headed in the right direction. • I’m extremely confident LAL will be awesome this season. To put it short, LeBron in my eyes has constructed a perfect team for his liking, and one that could win and grow now. Expect a top three seed. • I really hope PHX young core gets it together b/c I really love the talent on this team. I expect a nice turn around. • Same for SAC. A lot of talent that hasn’t yet been cemenented. Hopefully they figure it out too. • Do I need an explanation for GS? No. If they don’t win the title it’s a crappy season. • HOU has all the pieces to succeed, and gave the Dubs a run for their money last season. Maybe an inspired Melo can boost this squad just a bit more. • I’m so frustrated from Murray’s injury since I thought he was going to explode for SA this season. The Spurs won’t be as good now, but don’t underrate Derozan-Aldridge. Maybe they’ll bring in a replacement PG too. • I’m so excited for the Dennis-DJ-Luka trio in DAL. Doncic is my ROTY pick and I really think he’ll be great. • “Meh” is a good word for MEM’s team. The team is just OK with Conley, Gasol, and not much behind running the show. • Rondo and Boogie left, but NO must put it behind them if they want to succeed. Holiday, Mirotic and underrated Lakers outcast Julius Randle should do a solid job of picking up the slack. AD is also my MVP pick. Leave your NBA pre-season takes below and make sure to check @coleonsports all season for updates!